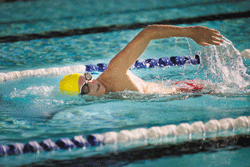 To exercise in interval-training mode, swim a fast lap, rest, and then swim another fast lap. It helps build cardiovascular fitness with shorter workouts. Have you heard about interval training but aren't sure how it works and whether it's right for you? Interval training simply means alternating between short bursts of intense exercise and brief periods of rest (or a different, less-intense activity). The payoff is improved cardiovascular fitness. "Aerobic or cardiovascular training is designed to develop a healthier heart and circulatory system," says Howard Knuttgen, research associate in physical medicine and rehabilitation at Harvard-affiliated Spaulding Rehabilitation Hospital and a past president of the American College of Sports Medicine. "Some regimen of aerobic training is really essential to good health." Guidelines advise men to strive for 150 minutes of moderate-intensity exercise per week. In practice, that could be 30 minutes of exercise on five days of the week. Brisk walking is a good example of moderate-intensity exercise, but any kind of activity counts as long as it requires some physical effort and raises your heart rate. Guidelines say you can also meet your target with half the amount (75 minutes) of higher-intensity exercise. In this case, the classic example would be jogging or vigorous lap swimming. That seesaw relationship between exercise intensity and duration is what makes interval training work—but you may need to break a sweat. "High-intensity basically means exercising at a higher intensity or velocity than you could otherwise sustain for five to 10 minutes before becoming exhausted," Knuttgen says. In interval training, "you do high-intensity exercise for a minute, then rest, then repeat." Some men find pushing their limits invigorating; others find it unpleasant. "A man might think this isn't all that much fun," Knuttgen notes. But remember that you don't necessarily need to stick to interval training all the time. You can, for example, do interval training on one day and switch the next day to longer-duration, moderate-intensity exercise. As fitness improves, you should feel better, with greater endurance and more get-up-and-go. However, cardiovascular training doesn't significantly boost muscle strength or power. Knuttgen points out that even elite marathoners don't have unusually strong leg muscles. But their hearts and lungs work together at peak performance. No matter what type of cardiovascular training you choose, you need to do it regularly to see the improvements. "Three days a week is a good recommendation—more if you can, but not much less and definitely not just once a week," Knuttgen says. In an otherwise healthy man, interval training should not present major risks, as long as you don't dive in too fast. "If you haven't done this before, begin slowly," Knuttgen says. "As you find it easier to exercise, you can increase the intensity." If you have heart disease or high blood pressure, talk to your doctor before starting interval training or any other new exercise program—especially if you've been relatively inactive until that time. You can reduce the risk of straining a muscle or joint by starting with a gentle warm-up before your workout to loosen your joints and get the blood flowing. Be prepared to "feel the burn" after your challenging new workouts. It's normal to feel sore for a day or two as your muscles recover. A day of time off between workouts is a good general practice. Aerobic exercise gets your lungs and heart pumping to deliver the oxygen to your muscle cells, which use it to pro-duce energy. You can use your heart rate to find the level of exercise that gets you in the aerobic zone and enhance cardiovascular fitness. Subtract your age from 220 to roughly approximate your maximum heart rate during exercise. Exercising at between 60% and 70% of your estimated maximum heart rate is sufficient to build cardiovascular fitness. If you can gradually condition your way up to 80%, the fitness gains will be even more noticeable. Using a wearable heart rate monitor can help you stay in the aerobic zone and show the benefits as your fitness improves.